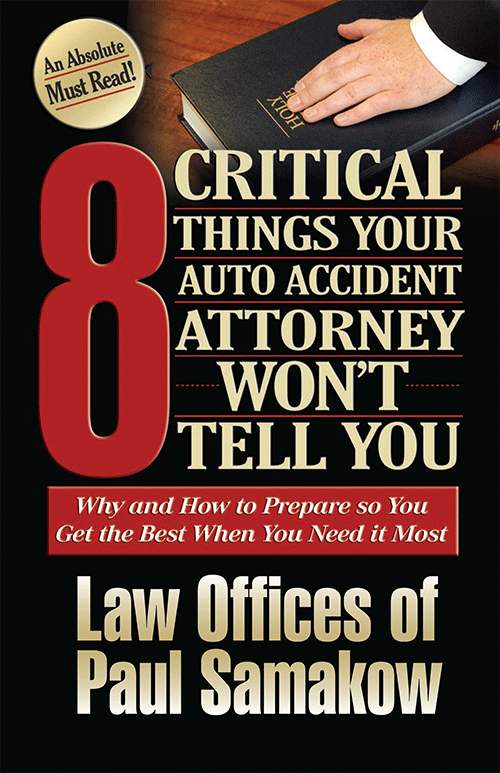 Ten Strategies for Getting More Money in Auto Collision Cases | The Law Offices of Paul A. Samakow, P.C. Without question, over the last several years, the insurance industry has become more aggressive, more demanding, and less forgiving of all claims for injury resulting from. Innocent victims are often made to feel like liars, and real life tragedies are minimized constantly by claims adjusters who are trained to act nice initially, and to then limit, deny, stall, delay, avoid and ignore. Without question, an auto accident victim is generally not equipped to deal with these trained insurance professionals. The following is not legal advice, and should not be relied upon for results in specific cases. Consultation with an attorney is highly recommended when an individual has been involved in an auto accident. For those looking to attempt to resolve their own claims with an insurance company, consider these 10 very important items. 1. Individuals who “do the little things” right generally will receive higher settlement offers. Collect all of your medical bills and assure they all have the DIAGNOSTIC and CPT codes on them. The billing offices can provide these. Having these codes on the bills assures that the insurance company can process the bills promptly. Get all of your medical records related to treatment for accident related injuries. Insurance companies don’t know what happened to you, thus, you have to supply the records to show them. 2. Keep a small 35mm camera in your car. This is the “throw-away” type of camera. Use this camera to photograph the damage to all of the cars involved in the collision. If your cell telephone has a camera, use that! This “evidence” is often critical for insurance companies. Without the evidence the photos provide, adjusters can minimize your claim by suggesting that there was not a lot of vehicle damage. While there is absolutely no relationship between vehicle damage and occupant injury, insurers claim that minor vehicle damage proves the occupants could not be hurt. If there is damage to the car, photograph it! (a) Take pictures of any visible injury. Bruises demonstrate deep muscle injury! Eventually they fade and will be forgotten, unless you have pictures! Cuts and lacerations also eventually heal, but with pictures their existence lives forever. 3. Choose the “right” type of doctor for your treatment and care. A doctor with a good reputation lends credibility to your claim. Conversely, a doctor with a bad reputation can destroy your claim. You probably should not be relying upon your family doctor, or an internist, unless they have extended experience with collision cases. These “wrong” types of doctors may inadvertently do something that can hurt your case. Personal Injury attorneys know which doctors to use and which to stay away from. 4. Follow doctor’s orders! If you are told to have therapy three days a week but you only go once a week, you will damage your case and jeopardize your health. Doctors will often allow you to obtain treatment “on assignment”, if you have an attorney who signs a “lien form”. This means you get to obtain necessary medical care without paying the doctor up front, or as you go, because the attorney agrees to pay your bill to the doctor once your case is settled. Without the attorney’s promise, you’d have to make payment arrangements yourself. Accordingly, it is advisable to use an attorney if you can’t afford medical care! 5. Keep a diary to document your injuries, and the things you cannot do. Few people remember details for very long. By the time you get ready to try to resolve your case, the fact that you couldn’t sit at your computer longer than 15 minutes for the first two weeks will be forgotten. The fact that you couldn’t sleep peacefully for a long time, and that made you irritable will also be lost. Your diary should be honest, and complete, without over-reaching. 6. Keep receipts for everything! Even a three dollar ($3.00) receipt for aspirin. The $3.00 isn’t going to make a difference in your claim, but it is evidence of your pain, and evidence that you bought the aspirin to try to alleviate that pain. 7. If you find yourself talking to the insurance company, be careful of what you say!!! They will use anything and everything they can against you. No matter what, do not lie! Do not exaggerate! Even a small lie can ruin your credibility. If you hire an attorney, the attorney should do all of your talking for you. That is why you hired that attorney! 8. If you miss time from work because your injuries prevent you from working, or because you need to see the doctor or therapist, prepare for a review of your salary or wage information. Have your boss or supervisor prepare a letter stating what a fine employee you are, when you were hired, what your job entails, what your salary is, and their understanding as to why you are missing work. Insurers will want proof of your salary, and proof you were not working. They will also want proof that you couldn’t work. Get your doctor to give you “work disability certificates” with each visit, and keep copies for your records. Once the doctor tells you to return to work, do so! 9. Do not overlook “other sources” of payment for your claim. Your automobile policy may have medical payment, or medical expense benefits. Some jurisdictions call these benefits Personal Injury Protection, or PIP. If you have these benefits, whatever they are called, use them! (If you don’t have these benefits, call your agent and get them to protect yourself for next time!) In some states, such as Virginia, auto med-pay benefits “stack”, meaning you get to multiply the benefits by the number of vehicles on the policy. So if you have $2,000.00 in med-pay benefits and 3 cars on the policy, you have $6,000.00 in benefits available to you! Next, use health insurance if you have it, but be mindful of possible company requirements forcing you to use “in-plan” doctors (see #3 above). Check with your health insurance company to determine if they, are allowed to seek reimbursement when you later get paid from settlement by the at-fault party’s auto insurance company. A quick review of possible places to obtain money (all insurance companies): (a) You get paid by the other guy’s insurance; (b) your bills get reimbursed if you have med-pay or PIP benefits on your auto policy; and (c) your medical bills get paid by your health insurer. YES YES YES, THIS IS ALL COMPLETELY LEGAL! If you think about it, it makes sense! You pay premiums for your auto policy’s protections, and you also pay premiums for health insurance. If you don’t avail yourself of these benefits, which you paid for, you are literally throwing money away! Finally, the law says the other guy who caused your injuries has to pay, and that has nothing to do with payment from your auto or health insurers. 10. HIRE A LAWYER, AND DO SO EARLY IN THE PROCESS if there is any injury requiring anything more than a “check up” to see if you’re okay. If you are hurt, you’ll know it. No matter what the insurance adjuster tells you, they pay more on claims when lawyers are involved. WITHOUT QUESTION, a lawyer will get you more money, which you deserve, even after the lawyer’s fee is taken out, than you can possibly obtain by yourself. The simple reason is that the insurance company has no risk dealing with you. The risk when a lawyer is involved is a lawsuit. Why should the insurer offer you a “fair” settlement when they have no risk of having to pay more? With a lawyer involved, they will act more fairly to avoid having to pay for litigation defense costs, and to avoid a possible/ lawsuit verdict. Don’t make the mistake of trying to negotiate, to see what the adjuster will do. Once they make an offer, it is very difficult for an attorney to get them to substantially increase that offer. Adjusters do not want to look bad to their superiors if they suddenly drastically increase that offer. They also recognize that they could be subject to big-time trouble for applying different rules to people based on whether they have a lawyer.